"I was shocked at first, but having arms like this is actually pretty rad." ARMS is a boxing/fighting game made for the Nintendo Switch from the same development team behind the Mario Kart franchise. Revealed during the January 2017 Nintendo Switch Presentation, the game (appropriately) features follows numerous characters that fight using long, extendable arms. A series of online demo periods, called "Global Testpunches," were held May 26-28 and June 2-4. The game was released on June 16, 2017. 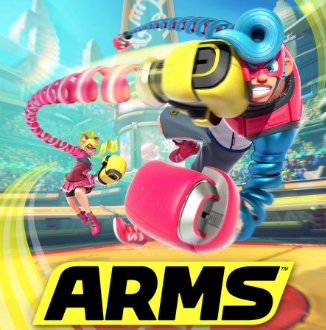 ARMS uses motion controls, much like the Wii's Wii Sports and Punch-Out! !, though the gameplay style is more akin to Sega's Virtual-ON series of fighting games. It also has the option for traditional button controls, though Word of God says using traditional controls may limit your skills. Not to be confused with actual limbs, weapons, the robot from Dr. Robotnik's Mean Bean Machine, the Animation Studio ARMS, the manga and anime Project Arms, or the video game series Wild ARMs. All There in the Manual: The gallery added in 5.0 contains a group of "ARMS Secrets" images which is mostly used to explain various things about the world of the game. It also adds a caption to any Grand Prix image to help put things into context. Always Night: The Mausoleum, Snake Park, and Sky Arena during the Hedlok fight always take place at night. Sky Arena is otherwise taking place at sunset. Averted; it's been revealed that much of the cast is human, but woke up one day with the ARMS power. Played straight with Master Mummy and Kid Cobra; Master Mummy appears to be undead, while Kid Cobra's general body shape is very snake-like compared to the other human characters. Anime Hair: Spring Man and Ribbon Girl's hairstyles definitely do live up to their names. The same can be said for Ninjara due to his ponytail looking a bit like a shuriken. Min Min's hair looks like ramen noodles, and Twintelle's hair is so long that she uses it in place of her arms. Lola Pop also has a bun that looks like a piece of hard candy. Dr. Coyle's hair is a pompadour with very long bangs covering her eye. Bait-and-Switch Boss: In Grand Prix, Dr. Coyle will launch Max Brass out of his arena when the player reaches him on Level 6 or 7, taking his place in the process. Her Chest Insignia is a stylized version of "麺", the Japanese kanji (and traditional Chinese character) for noodles. While her given name in English is "Min Min", the Japanese pronunciation takes care to add a separate sound to her name, making it sound more like "miàn miàn", the Chinese word for noodles that would evolve into "ramen". "好吃!" (Hǎo chī!) — "Yum!" "我愛拉麵!" (Wǒ ài lāmiàn!) — "I love ramen!" Boring, but Practical: Bubb and Buff ARMS have no special attributes or elemental attacks, but will still fly straight at an opponent and come back quickly. Break Meter: Doing repeated damage to a player's block shield will eventually break it, leaving the player vulnerable. Bullet Time: Twintelle can slow down an opponent's attacks when they approach her. Camera Fiend: Twintelle's home stage has a cameraman in the background and they're definitely determined to record every angle of the battle. Capital Letters Are Magic: Used to distinguish between actual limbs and Extendable Arms. Casting Gag: Donna Burke plays Dr. Coyle, a mad scientist woman in a fighting game who experiments for personal gain. Dr Coyle wants to make herself into the best ARMS fighter. Burke was also in Rumble Roses, where she played Dr. Anesthesia/Cutter, who uses the DNA from wrestlers she tricked into joining the fight in order to develop the ideal super soldier. Censored Title: Dr. Coyle's stage is "[NAME REDACTED]", complete with brackets and capital letters. Chained Heat: In the 2-on-2 team fights, you and your partner are connected to each other at the waist by strings. Character Customization: You can change the boxing gloves for each character to different ones with various properties, from elemental abilities to different weight classes. Character Roster Global Warming: At launch, the game had only one true heavyweight (Master Mummy) with Mechanica as a pseudo-heavyweight thanks to her mecha. Max-Brass became the second true heavyweight after Version 2 launched. Chest Insignia: Each character has their individual symbol displayed on their upper body. Color-Coded Characters: Spring Man is cyan, Ribbon Girl is red, Ninjara green, Mechanica yellow, Master Mummy purple, Min Min orange, Kid Cobra lavender, Barq & Byte both blue, Twintelle light pink, Helix dark green, Max Brass navy blue, Lola Pop yellow-orange, Misango blue, Springtron red and black, and Dr. Coyle green and purple. Conlang: Like The Legend of Zelda and Splatoon, the game's in-universe language is composed of this. That being said, some of the languages they speak in their quotes do seem to match up with languages found on our Earth. In particular, Dr. Coyle basically speaks nothing but proper English in her True Final Boss fight, including "My masterpiece!" "Useless!" and "Gah... I could have won!" Developers' Foresight: If a character gets hit just as they're activating their Rush Attack, their activation line will reflect them getting interrupted, just like how the characters in Punch-Out!! Wii react when their punches are avoided. For example, Spring Man's "OH YEAH!" turns into an "OH no" upon being interrupted . Die, Chair! Die! : The Scrapyard, DNA Labs, and Temple Grounds all have structures that can be destroyed with enough hits or with a character being tossed into them. After the Version 4.0 update, destroying all of them for each stage yields a badge. "Do It Yourself" Theme Tune: Ribbon Girl is an idol; she sings the game's main theme and the theme for her own stage, the Ribbon Ring. Domino Mask: Most of the human cast wear these as their normal attire, and so do their fans. Apparently the mask is part of how they control their ARMS power; when they take it off, their arms become much less stable. Downloadable Content: As in Splatoon, new fighters, stages, and ARMS are added through free post-launch updates. Don't Try This at Home: What one of the tips say when entering Hoops mode. Easy-Mode Mockery: Play Grand Prix on a difficulty setting of 3 or lower and the game will end at Max Brass. The ending will also be less triumphant with the lack of a credits scroll or ending image. Elemental Powers: Equippable Arms can have one of eight attributes: Fire which burns and knocks down your opponent, Electric which briefly disables their arms, Wind which blows them back, Ice which freezes and slows them, Stun which paralyzes them, Explosion which explodes them, Blind which throws gunk on their screen, and Poison which slowly damages them over time. Evolving Title Screen: On each major update, the newly-introduced fighter is shown squaring off with one of the original fighters. Version 2 focuses on Max Brass, Version 3 focuses on Lola Pop, Version 4 focuses on Misango, Version 5 focuses on Dr. Coyle. Exactly What It Says on the Tin: ARMS is a game about arms. Enormous, springy arms. Excuse Plot: You have some Extendable Arms because you Just Woke Up That Way. Go fight in a tournament! Exotic Eye Designs: Humans with the ARMS power have a unique "vortex" design to their eyes. The only one who doesn't is Mechanica; she's a regular human who uses a mech suit to fight. Extendable Arms: The main theme of the game. The fighters use their coiled arms to blow fisticuffs at each other. Fanboy: Biff and Mechanica are noted to be fans of Ribbon Girl. A piece of official artwork puts this into action by having their idol autograph the yellow fist-head's shirt resulting in eye sparkles. Meanwhile, Mechanica is peeking from behind a wall watching the scene with a shocked on her face and tears in eyes. Gone Horribly Right: The gallery reveals that Hedlok was originally intended to act as a sparring partner/sandbag to train ARMS fighters. One scientist notes that technically, they have fulfilled the stated goal of the project once he escapes to hijack that Grand Prix. Good Colors, Evil Colors: The more heroic/Face characters like Spring Man, Ribbon Girl, and Byte and Barq have blue and red color palettes, while the more Heel/rival characters like Ninjara, Master Mummy, Kid Cobra and Dr. Coyle have green and purple palettes. Quite downplayed in that none of the characters, except Coyle, are actually "bad guys". Hartman Hips: Ribbon Girl, Min Min, and especially Twintelle sport very broad hips. Immune to Flinching: Master Mummy and Mechanica have this trait, and hitting them does not disrupt their current punches or grabs. In-Series Nickname: Rasen Ninjitsu University is more known to the public as "Ninja College". Just Woke Up That Way: Many of the playable characters are just normal folks who just suddenly woke up with Extendable Arms. In-universe, no one is sure why this happened and falls back onto this for the reason why they got them. Mini-Game: There are a few mini-games within ARMS: V-Ball (a mix between volleyball and hot potato), Hoops (basketball, but with your opponent as the ball), Skillshot (breaking as many targets as you can), and 1-on-100 (a full-on Multi-Mook Melee). The first three mini-games are played in Grand Prix and ARMS Test, and they must be won to continue a streak. Mirror Match: Every Grand Prix on levels 1 through 5 ends with a fight against Max Brass, including if you're playing as Max Brass himself. The explanation: You were playing as the fake Max Brass. But once you beat Grand Prix, it's revealed that you were playing as the real Max Brass all along. More Dakka: Dr. Coyle can utilize this with multi-shot type ARMS, and with her signature ARM, the Lokjaw. Since she grows a third arm after charging, if all of her arms are the Popper, Cracker, Revolver, Retorcher, Tribolt, Lokjaw, Biffler, or Hydra, you can unleash a volley of mini-missiles. One of the badges even requires this (specifically, with the Revolver)! Multi-Mook Melee: 1-On-100 involves the characters fighting off 99 One Hitpoint Wonder prototypes of Helix, and then facing off against a Hedlok-controlled 100th one. Nintendo Hard: Higher difficulty levels (even the middle difficulty, Level 4) are extremely hard, with AI fighters being very intelligent, defensive and evasion-heavy, and Hedlok borders on an SNK Boss. This was toned down in Update 5.0, so that it gets steadily more difficult as you progress through the Grand Prix. Level 7 remains consistently difficult, however. Non-Elemental: In the starting roster of available ARMS at launch, three of these (Buff, Megaton, and Bubb) have no attribute applied to them. Off the Chart: Helix's character profile page shows that his "gross factor" is so high, it leaps past the edges of the chart and the user's web browser. Our Dragons Are Different: One of the main ARMS choices Min Min and Helix can use are dragon heads. Min Min's shoots a beam while Helix's specializes in ice breath. Some of the equippable gloves are this, like Master Mummy's signature Phoenix and Twintelle's Thunderbird, but they also have different elemental attributes to change how they play. The enemies in 1-on-100 mode look like black versions of Helix. Clicking the left thumbstick and then holding a direction when selecting a character will swap between one of four available palettes (with Up being the default color). The fans in the background will also change their outfits to match. People Jars: Present in Helix and Dr. Coyle's fighting stages, which hold what appears to be other Helixes. Pink Girl, Blue Boy: The two mascots feature this. Spring Man's colors heavily feature a pastel blue while Ribbon Girl's is a pastel pink. Power Fist: Each character can equip a variety of weapons for each of their arms. They all have three signature weapons. Primary-Color Champion: The lead (or at least default) character Spring Man's color scheme is mostly red and blue. Pastel red and blue. His boxart rival Ribbon Girl is primarily red and blonde, with blue eyes and a dark blue top, or breastplate, on her shirt. Pun-Based Title: The title refers to the arms the characters box with, and the arms that the boxers arm themselves as fist weapons. Randomly Gifted: In-game lore reveals that the ability to have stretchy arms has been known since ancient times but its exact mechanism of who obtains this ability is unknown. Some theories suggest that it's a random quirk of evolution or the result of alien experimentation. Recurring Riff: Most of the game's music incorporates bits of the game's main theme ; the instrumentation varies from song to song. For example, Ninjara's stage plays it on a violin, Helix's stage uses a warbly synth, and Twintelle's stage uses a triumphant horn section. Rocket-Tag Gameplay: A few of the Bonus Rounds in Party Crash become this. Big Time ARMS (your ARMS are huge and do triple damage) and SO MUCH RUSH (the Rush meter fills instantly) both greatly increase the rate of damage you can dish out and make getting hit much easier and much more detrimental. But the true embodiment of this is One Hit Wonder, where the first attack to land is an instant KO. Rubber Hose Limbs: Being made of coiled springs, the arms of the fighters are capable of extending out quite far and ways that are impossible with bones and joints. However, these arms appear to be capable of coiling back up to resemble normal arms. Shoryuken: Spring Man's grab move has him throwing his opponent with a shoryuken. Something Person: Spring Man and Ribbon Girl, the faces of the game, fall under this name scheme. There's also Helix's Japanese name, DNA Man. Tactical RockPaperScissors: Blocking, punching, and grabbing moves have this relationship between each other; punches are negated by blocking, blocking is useless against grabs, and grab attempts can be canceled out with a single punch. True Final Boss: Hedlok controlling Dr. Coyle. Spring Man: Shown at his ceremony with multiple belts adorning his arms. Ribbon Girl: Back to her pop idol business, with multiple fans possibly part of her troupe. Mechanica: Teaching a group of people about her mech, the champion's belt hanging on her wall. Master Mummy: Shown being interviewed by Biff, having had finally found his family. Ninjara: Back at Ninja College with the belt in tow. Min Min: Serving ramen at her parent's shop to adoring fans. Twintelle: Performing in her next movie. Byte and Barq: Byte is shown relaxing at a beach, Barq playing in the background. Kid Cobra: Taking a selfie with the fans and basking in his newfound popularity. Helix: Alone in the ARMS lab, smiling happily over his prize. Max Brass: Admiring all the belts he has won that are framed and hanging on a wall while his newest part to the collection lays on a nearby desk. Lola Pop: Is shown with a poster that reveals she opened up the circus she always dreamed to run. Misango: Having a meet with Biff while his fellow Misangans explore their weird new friend. Springtron: A photo held by an unknown person depicts him connecting with a young fan of his, while the rest of his fans look on in horror. Dr. Coyle: A torn, old, but re-taped photograph of her and Max Brass in happier times. Wind Is Green: The Wind attribute's main color is green. Biff: As another TV Tropes article draws to a close, I'd like to thank all the tropers and the fans at home. See you next time, folks!